Appearantly, the folks in Louisville aren’t so smart. It seems to be working for the most part. The water in the pools is much cleaner this year after the signs were installed. Of course, that could be attributed to the change in the source of some of the water to actual drinking water. I find it slightly amusing that people don’t understand the sign. It’s not much different really from the number of people who can’t find their state on a map of the U.S. The water in the fountain pools is, like all water, made of two-thirds hydrogen atoms and one-third oxygen atoms. And as any chemistry student can tell you, there is no health threat from coming into contact with H20. David Karem, the Waterfront Development Corp.’s executive director, had the signs made to try to keep people out of the water after health officials raised concerns about bacteria in the fountains last year. Now that we’ve had a little laugh at these folks… Let’s take a look at the title of the article. Um… isn’t water without hydrogen just oxygen? Ok, if it were a pure oxygen pool, there is some hazard for fire and such, but then for oxygen to pool, it would have to be suppressed by a gas that is lighter than it and that would most likely be more dangerous than the actual oxygen… Well, you get my point. 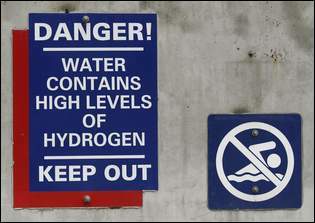 Ah – but imagine DIVING into a pool of “water” that has no hydrogen…so the warning is warranted. Right?